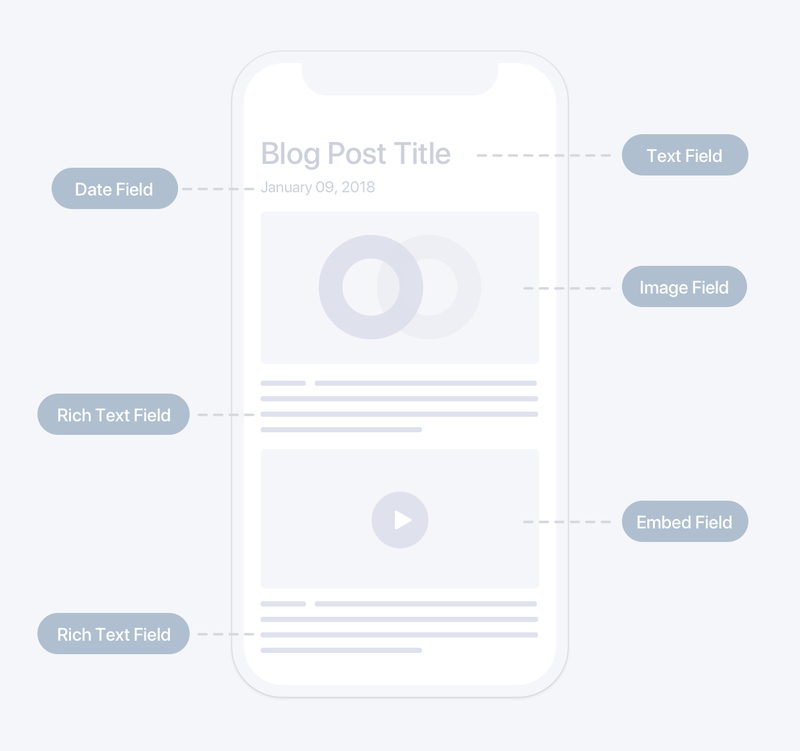 Breaking down every page or view into basic elements like "text", "image", "date" or "location" – that’s content modeling. It’s very similar to database modeling. Example: A content model for a blog post. Each type of content is modeled as a separate field. In a way, a content model is the bridge between content and code: it’s a compromise between completely free-style content design and highly structured content representation on the frontend. Sure there’s a lot of variations to this: some parts can happen simultaneously, sometimes the content can be created in the beginning. 2) redoing the content model and extra work for content managers. A content model largely defines the UX of a CMS for both developers and authors. Similar to database design, setting up a content model takes only a few minutes, but the implications are long-lasting. Once a content model is in place and content managers start creating content and developers start building the frontend, every change to the content model is costly: adding or removing 1 field would mean changes both in the code and to the content. Which is why a lot of thought should go into the content model before implementing it. The common practice goes like this: developers set up the content model without considering what it’d be like for content authors to actually work with it. It seems reasonable: developers optimize the CMS to simplify development. However, it might turn out that what’s good for developers might be counter-productive and inconvenient for authors. But, since changing an existing content model is expensive (see above), most likely it’ll stay this way. A better practice would be for developers to get the content teams involved early in the project to collectively figure out a content model that acts as a healthy compromise between developers’ and authors’ interests. Prismic is a headless CMS with an API and a CDN that aims to simplify editing content on the internet and to make work equally enjoyable for developers, marketers, and content teams.